Dubai, UAE - February 07, 2016: One of the most beloved and sought after Kuwaiti singers, Abdallah Al Ruwaished is all set to celebrate the Kuwaiti National day when he performs live on Global Village’s main cultural stage on Friday, February 26th, before thousands of guests at the 20th season of Global Village - the leading cultural, shopping and entertainment destination in the region. This concert is presented by the Kuwait pavilion. With 32 pavilions representing over 75 countries with different cultures, Global Village is the one-stop family entertainment destination in the GCC and the MENA region. This is the destination’s 20th season and to commemorate the special occasion, Global Village has invested in an even more exciting line-up of retail offers, outdoor attractions, concerts and entertainment. Several leading international artists have performed at Global Village since it opened in November 2015 – from Emirati sensation Abdullah Belkhair to Palestinian artist Manal Moussa. As the season continues, guests can look forward to a mix of Arabic, Far Eastern, Indian, Afghani and African artists and performances. 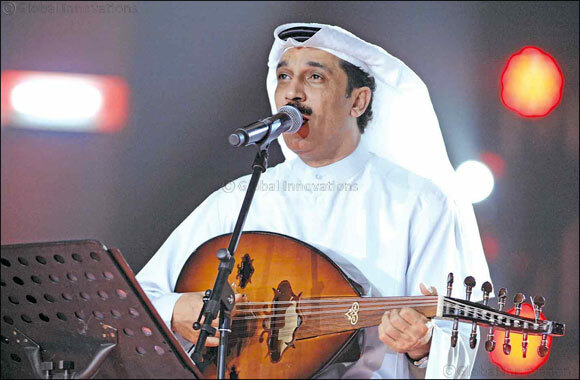 Ruwaished began his solo career in the early 1980s with the release of his first album “Rahalti” and went on to become the Ambassador of the Kuwaiti song with fans from across the globe. He has released over 25 albums throughout his career such as 'Lummi Bishouq,' “Tasawer”, “Wainek” and “Sadiqini” to his last Album entitled 'Ma Fee Ahad Mertah,' which was released in June 2005. The event is not ticketed separately inside Global Village and families can pay the regular entrance fee to enjoy all the entertainment offerings including Abdallah Al Ruwaished’s concert.